Race Report: Ruben Plaza took a brilliant stage win more deserving of 1915 rather than 2015 as he went clear for 100km by himself. Behind him Fabio Aru and Astana finally managed to distance Dumoulin and take the GC victory. How much can happen in 176km? The greatest victory of the season and a GC battle that went down to the final kilometre. Despite the length of the stage, Aru made a key move to win the Vuelta when Astana placed men in the break within the first 30km for Fabio to rely on later in the day. Dumoulin looked comfortable for the first two mountains but he was broken on the penultimate climb by Aru's attack and although he got within 10 seconds of the Italian on the descent his GC hopes were finished when Zeits and Luis Leon Sanchez came back from the break to help him pull away. There was a late attack from Majka and Quintana as they hoped to take 2nd overall from Rodriguez but the team work of Astana and Katusha was enough to keep Purito in 2nd overall. The day belonged to Plaza though who went clear with 117km to go and never looked back despite 37 riders trying to bring him back. It's days like this that make watching cycling a joy. 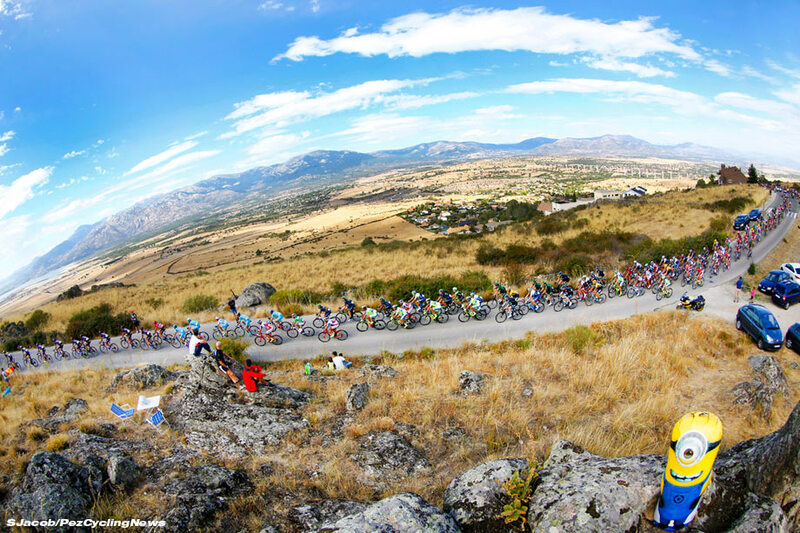 The last meaningful stage of the 2015 Vuelta. There's 176km of racing with four 1st category climbs. The route heads north and then east for a 40km loop before heading back along exactly the same roads the first part of the route travelled for a finish in Cercedilla. That means that we're climbing the Puerto de Navacerrada (9.4km @ 6.6%), it will be called the Puerto de Cotos (11km @ 5.3%) for the second ascent, and Puerto de la Morcuera (11.5km @ 5.4% and 10.4km @ 6.6%) twice. 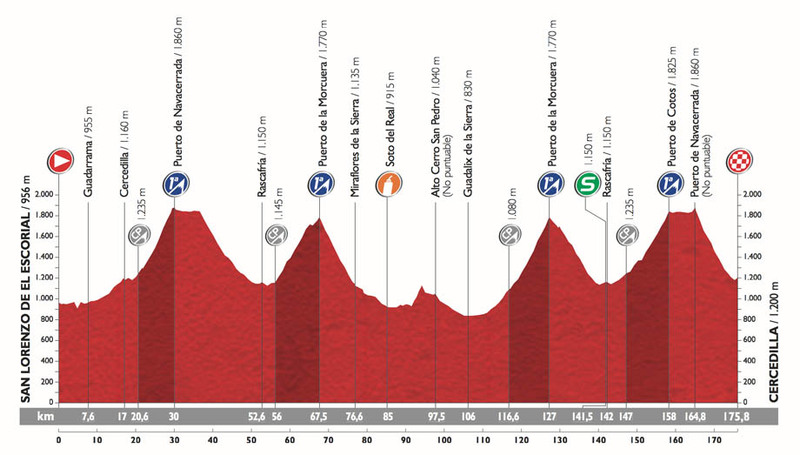 None of the ascents are overly steep and the riders will be grateful of the downhill finish but none the less, this is going to be a horrific day in the mountains. The day started with some controversy for Fabio Aru (Astana) after footage emerged of him receiving a handsling from team mate Luis Leon Sanchez. Despite the footage being conclusive the commisaires decided not to impose a 10 second time penalty on the Italian and so he goes into the penultimate stage just 6 seconds behind the massive Dutchman, Tom Dumoulin. To put that into perspective, the Great Britain Olympic team pursuit riders beat the third placed New Zealand team by 5.2 seconds in 4km, Aru and Dumoulin are split by 6 seconds after more than 3,000km of racing. With many teams still looking for something from the final Grand Tour of 2015 the early part of the stage was animated by a large attacking group. The lead group consisted of 11 riders; Ruben Plaza (Lampre-Merida), Olivier Le Gac (FDJ), Adam Hansen (Lotto-Soudal), Jaco Venter (MTN-Qhubeka), Lawrence Warbasse (IAM Cycling), Dani Navarro (Cofidis), Jay McCarthy (Tinkoff-Saxo), Jose Goncalves (Caja Rural), Eduard Vorganov (Katusha), Miguel Angel Rubiano (Colombia), Moreno Moser (Cannondale-Garmin) and Yukiya Arashiro (Europcar). They had a minute gap over the even larger chasing group containing; Kevin Reza (FDJ), Andrey Amador and Fran Ventoso (Movistar), Haimar Zubeldia (Trek Factory Racing), Carlos Quintero (Colombia), Joe Dombrowski and Alex Howes (Cannondale-Garmin), Matteo Montaguti (Ag2r-La Mondiale), Sergio Henao and Nicolas Roche (Sky), Andrey Zeits and Luis Leon Sanchez (Astana), Giovanni Visconti and Jose Joaquin Rojas (Movistar), George Bennett (LottoNL-Jumbo), Pello Billbao and David Arroyo (Caja Rural), Nelson Oliveira and Valerio Conti (Lampre-Merida), Alberto Losada (Katusha), Matteo Montaguti (Ag2r-La Mondiale), Alessandro de Marchi and Amael Moinard (BMC), Kenny Elissonde (FDJ), Carlos Verona (Etixx-Quick Step), Jelle Vanendert and Jasper de Buyst (Lotto-Soudal), Alex Cano (Colombia) and Romain Sicard (Europcar). Astana and Movistar were clearly planning for the end of the stage with the guys they had placed in the break. With men in the break they were also leaning on Giant-Alpecin to do all the work, that was a difficult job for a team where only Lawson Craddock had really been able to get anywhere near staying with Dumoulin in the mountains. Despite having greater numbers the second group still hadn't been able to make contact with the 11 leading riders. Although there was no change in the position of the two groups there was a change in their make up as Le Gac dropped back from the lead group to assist the second group and bring Elissonde to the fore. Elissonde announced himself to the cycling world two years ago on stage 20 of the Vuelta finishing on the Angliru. Since then he's struggled to build on that success and after two disappointing seasons a win here would be a very welcome relief. Jose Goncalves (Caja Rural) took the mountain points at the summit of the Navacerrada and his acceleration helped push the lead group's advantage out over the minute advantage. The chasing group had far more firepower but the size was unwieldily and they were still struggling to chip away at the advantage. On the second climb of the day Ruben Plaza was unhappy with the pace of the leading group and he decided to go it alone with more than 100km left to ride. He wasn't joined on this ambitious (foolish?) break attempt but with 3km to go until the top of the second climb he was fighting the forces of the 9 riders he'd left behind and the 29 riders from the second group who had now joined together. At the top of the climb Plaza had a gap of almost three minutes over a disinterested chasing group. The gap seemed substantial but the Spaniard now had to deal with 40km of rolling valley road and try and hold off the 37 men who were chasing hard behind. The Spaniard was driving on but his advantage had already had a minute sliced off. Prior to the feedzone the very large chasing group had fallen apart and there were now 12 riders, including 3 Movistar riders, who had uncoupled from the other 25 men and were working hard on reducing Plaza's advantage. The split in the chasers was short lived and with 84km to go they were all together with a 1 minute deficit on Plaza and a 10.40 advantage on the peloton. The peloton were led by a mix of Giant-Alpecin and MTN-Qhubeka, who were protecting Louis Meintjes 10th overall position. With the lull in the action between the final two climbs it was time to marvel at the consistency that Dumoulin has shown so far this year, he's had 54 days of racing and finished 40th or lower just 5 times. Since the first day of the Tour de Suisse he hasn't been lower than 7th in the GC and finally, in the Vuelta, he has spent all but two days on the GC podium. 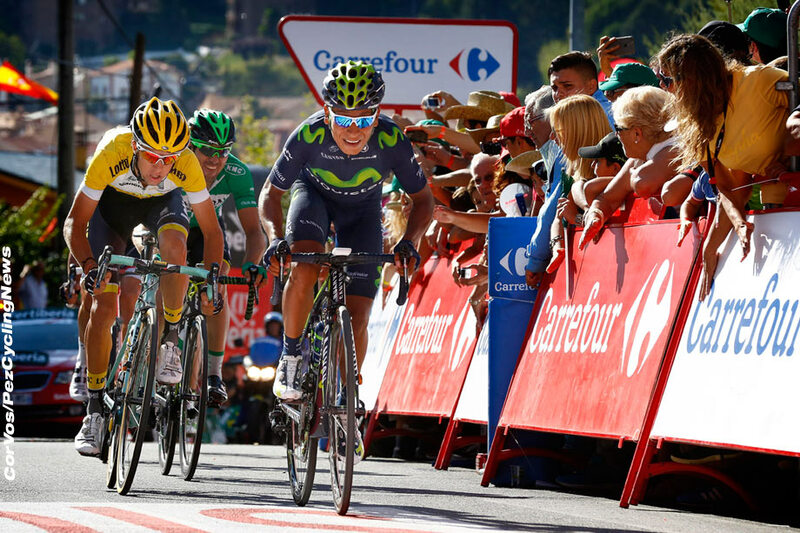 With Giant-Alpecin unwilling to shut this break down, Aru, Valverde and Quintana had a dilemma. Their plan to put men up the road was a good one but those helpers were now disappearing and their influence on the race was waning. For Ruben Plaza his hard work was paying dividends as he pushed his advantage out over 2 minutes from the rather lethargic chasers. One of the other emerging stories of the day was Nico Roche's pursuit of the green jersey. The Irishman was 19 points behind Joaquin Rodriguez (Katusha) and if he won the stage or came second and Rodriguez failed to score any points, lower than 15th on the stage, then Roche would be the surprise points winner at the Vuelta. Onto the penultimate climb and Plaza was still carrying a lead of almost 2 minutes but he was visibly flagging after such a long solo effort on flat roads. 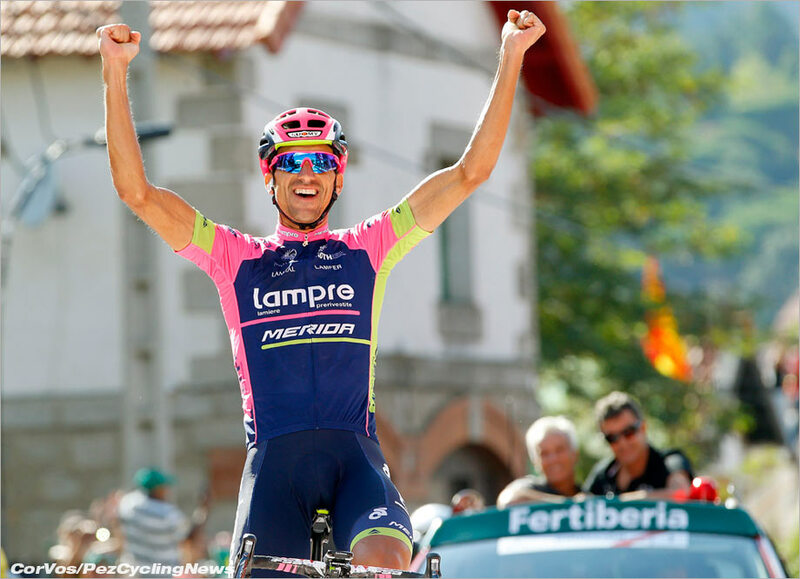 His lead was being cut by the combined efforts of Movistar and Cannondale-Garmin. Plaza's day wasn't over yet though and he was starting to re-find some power on the climb and he pushed his lead out to 3 minutes as George Bennett animated the chasers behind. The loyalties of the chase group had dried up and Visconti, Bennett and Elissonde were all trying to catch Plaza single handedly. In the peloton Astana's pace making wasn't putting Dumoulin in difficulty but it was hurting his support riders as one after another they fell away. Visconti's chasing efforts had been supplemented by previous stage winner De Marchi and the two Italians were closing to within 2 minutes of Plaza. In the peloton and Aru was putting more coal on the fire and it was enough to briefly distance the isolated Dumoulin. The first victim was Valverde who was sent packing from the elite group containing Mikel Landa and Fabio Aru (Astana), Esteban Chaves (Orica-GreenEDGE), Nairo Quintana (Movistar), Joaquin Rodriguez (Katusha), Mikael Nieve (Sky), Tom Dumoulin (Giant-Alpecin), Rafa Majka (Tinkoff-Saxo). Landa's pace making was brutal but the climb was a very steady gradient and he hadn't yet chipped the Dutchman off the back. At the head of the race Plaza had summited followed less than 2 minutes behind by De Marchi and Visconti. There was drama in the red jersey group as Aru attacked and finally distanced Dumoulin who was left flagging alongside Nieve behind the other 6 riders. Onto the ascent and the Giant-Alpecin rider had to close 20 seconds to Aru. Plaza was still leading as the descent levelled off but he was now trying to hold off four riders as Gonclaves and Montaguti joined them. The race was all behind them though as Dumoulin was eating into his deficit and was now just 10 seconds behind Aru and closing. Aru was doing all the work in the front group but the Dutchman's bike handling was superior. Nieve was helping Dumoulin but Aru had the support of his Astana team mates who had previously been in the break. He was also helped by Katusha who began riding in the hope that they could move Rodriguez up into 2nd place. That was the beginning of the end for the Dutchman who couldn't compete with the firepower of 4 Astana and Katusha riders. Dumoulin's grasp on the red jersey had slipped but he was in danger of losing the podium now as he fell more than a minute behind Aru. With 25km to go Plaza still had 1.45 over the four chasers. Irrespective of what the final result would be this was still a wonderful performance by the veteran Spaniard. He'd been out by himself for 80km but he was actually putting time into the Visconti group. Goncalves was the first rider to go alone and he immediately dropped his 3 companions. The man he was chasing, Plaza, remained in the big ring as he churned his way up the final climb and towards a remarkable win. De Marchi and Visconti caught and passed Goncalves and immediately put the Spaniard in difficulty, he was able to find enough to haul himself back on before the summit. The turquoise juggernaut kept going though and it was good news for Rodriguez who was up into 2nd on the virtual GC. Dumoulin was, as he has been since the start of the Vuelta, isolated as Nieve jumped away from him to try and bridge up to the Aru group. Plaza was looking in serious pain but the time gap wasn't showing this and he was even extending the lead as he edged closer and closer to the summit of the final climb in the Vuelta. The race had sunk into something of a procession until Quintana and Majka attacked from the Aru group to try and take 2nd from Rodriguez. There was no response from Purito who was happy to lean on the Astana train. The Spaniard was eventually forced into action as Astana couldn't limit Quintana's gains and he crossed the summit 35 seconds ahead of Purito. Inside the 5km and Plaza was on the downhill run to a monumental victory. He had won in a manner more akin to Fausto Coppi by going solo for more than 100km. Majka and Quintana were still ahead and the Polish rider was riding towards a possible 2nd on GC. Meanwhile Plaza was jubilant in victory, throwing away his gloves to the crowd as he took the greatest victory possibly of the whole year. He was followed home by Goncalves and De Marchi who had gone clear on the descent. Majka was on the verge of 2nd in the GC but it would be nail biting as he finished 2.41 behind Plaza. It was all eyes on Purito as he needed to reach the finish line no more than 1.10 behind. He managed it though and Aru dropped back to celebrate his first Grand Tour GC victory with his multiple team mates, team mates who had snatched the jersey from Dumoulin's back. It was a tough day for the Dutchman who finished 3 minutes down on Aru and fell away on the GC. Oh how cruel that Grand Tours have to be 21 stages long.